The SnapChat account for the Oklahoma City Thunder gave a preview of what the new Nike jerseys will look like. The two jerseys pictured were what used to be known as the home whites and the road blues. The home whites will now be known as the Association Edition jerseys, while the road blues will now be known as the Icon Edition jerseys. This upcoming season, the home team will choose what jersey they will be wearing and the road team will then have to wear a contrasting jersey. The home and away aspect of the jerseys will be going away. As far as the jerseys go, if you have seen the screen capture of the upcoming NBA 2K18 game with Paul George, then you have already seen what the Association uniform will look like. Here’s the Thunder’s SnapChat via UpTheThunder. Each team will have four jerseys to choose from. The Player’s Mindset jersey and the Community jersey will be unveiled at a later date. Nike will officially take over as the NBA’s outfitter on October 1st, 2017. In what became an unexpected bidding war between Nike and Under Armour for the rights to put Kevin Durant’s name on their sneakers, Ol’ Faithful (Nike) beat out the upstart (UA) to hold on to Durant as one of their basketball flag bearers. Nike retained the services of Durant by offering a 10-year deal that will end up being between $265 and $285 million dollars. Under Armour was rumored to have offered Durant a similar deal, with stock options and a rec center in his mother’s name to be included. Once the offer was made, Durant basically entered himself into restricted free agency, giving Nike the opportunity to match the offer. He informed Nike of what Under Armour had offered him and gave them a deadline. If the terms were not met by the deadline, then Durant would be taking his name to Under Armour. At the 11th hour, Nike matched the monetary offer made by Under Armour. The deal puts Durant on par with LeBron James in terms of shoe company earnings. Does this have any effect on Durant’s future in 2016? Probably not. While connecting the imaginary dots, many Thunder fans began to fret when Durant was considering Under Armour. The Baltimore-based company is located near Durant’s home town, and many thought the next domino to fall after signing with Under Armour would be to sign with his hometown Washington Wizards. 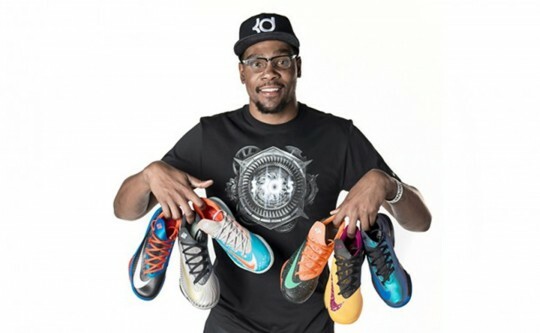 But now that he’s stuck with Nike, what will people hinge their predictions concerning Durant’s future on? In all honesty, Durant’s decision about 2016 will always be what it was going to be: a basketball decision. His shoe deal has no bearing on his basketball deal. Durant, like Lebron, is a stand alone superstar that transcends market size. 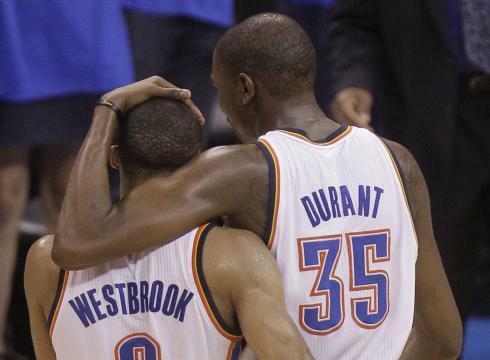 Who would’ve thought that the two most popular players on the planet play in Cleveland and Oklahoma City. Would Nike make more money if Durant played in New York or Los Angeles? Of course. 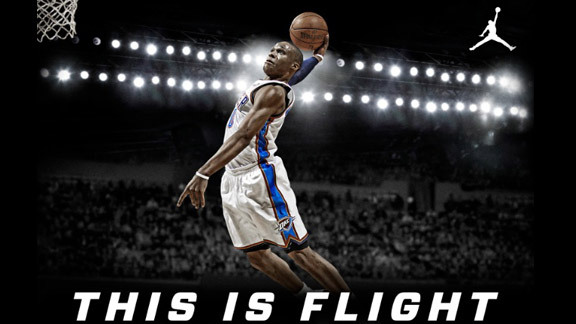 But even in Oklahoma City, Durant makes Nike enough money to justify signing him to a large endorsement deal. 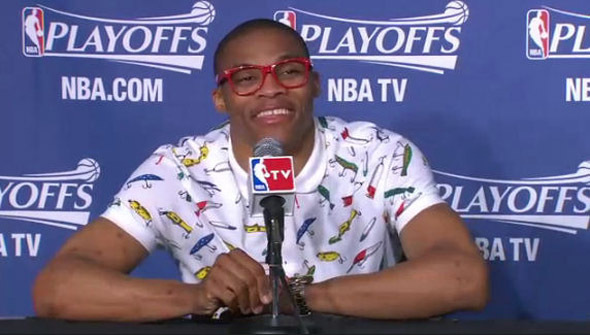 And that alone should make Thunder fans less frightened of the future. The saying goes, “Never judge a man until you’ve walk a mile in his shoes.”. The person who initially said that statement probably never met a superstar athlete with a shoe contract. All NBA fans (or wearers of athletic sneakers, for the matter) have walked around in a “man’s” shoes sometime in their lifetime. Be they Jordans, Kobes, LeBrons, KDs, D.Roses, Melos, etc, etc. Most of these shoes have one of 4 insignia on them: the Jordan Jumpman, the Nike swoosh, the Adidas 3-Lines, or the Reebok vector. With Kevin Durant rumored to be signing a 10 year/$325 million dollar contact with UnderArmour, a new insignia might be forcing it’s way into our collective basketball minds. Under Armour got its start as a football-centric company, with their moisture-wicking clothing and testerone-induced advertising (“We Must Protect This House!”). 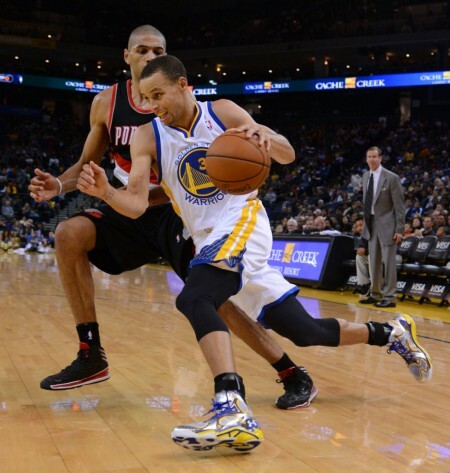 Within the last 5 years though, UnderArmour has been making a big push onto the hardwood. Their first big basketball move was signing recently graduated high school star Brandon Jennings, who eschewed the NCAA in favor of playing professionally overseas. Without the constraints of the NCAA, UnderArmour signed Jennings to a multi-year deal to promote their brand overseas. Although he has forged a good career, Jennings never quite became the star he was touted to be coming out of high school. In September 2013, UnderArmour snagged their current flag bearer for the company’s basketball division. Steph Curry switched from Nike to UnderArmour, bringing clout to the company’s desire to ascend into the conscious (and bank accounts) of basketball fans everywhere. They had an okay stable of players on their roster, but Curry gave them a recognizable star to hang their hat on. 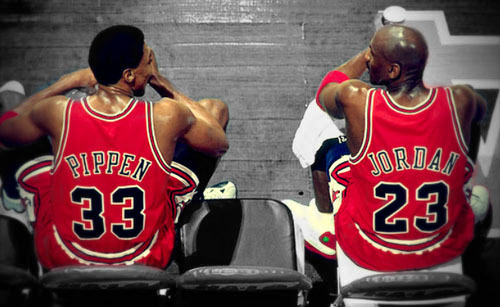 But like the great teams in the league, one superstar is good, but two superstars are better. 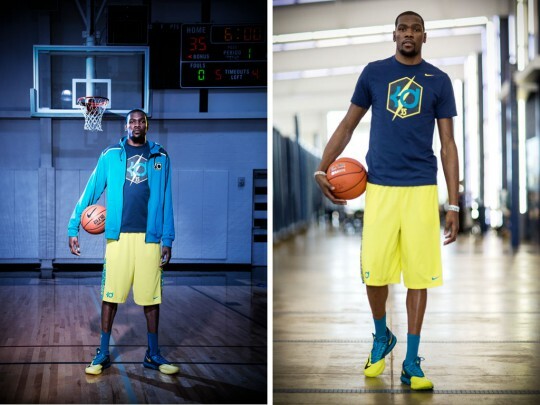 Durant would push UnderArmour into a different stratosphere. The reigning MVP is fast becoming one of the most recognizable figures in the sport, not only nationally, but worldwide. His dominance in international play and constant presence in the later rounds of the playoffs have thrown Durant into the conversation for best player in the world. For UnderArmour’s name to be associated with Kevin Durant’s shoes would be a coup for the upstart company. There would also be a hometown connection at play with UnderArmour. Their HQ’s are located in Baltimore, MD, which is relatively close to where Durant grew up. It can be speculated that Durant and UnderArmour CEO Kevin Plank have crossed paths numerous times in the DC/Maryland area. While Nike is the “it” brand in the NBA, Durant has let it be known that he is his own man. 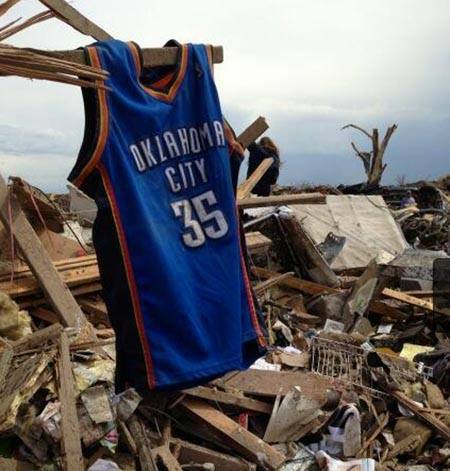 And if there is anyone that would be willing to take a chance on a hometown product, it would definitely be Durant. A small side note on Durant: If he signs this deal, he will be on tap to have earned over $500 million for his career in salary and endorsements. Sprint, BBVA, Panini, 2K Sports, Skull Candy, Kind snacks, etc = Has to be over $14 million. Related note: He’s only 25 years old. He’s halfway to earning a billion dollars with at least 10 years of earning potential left. Unless he “Tiger Woods” his life or is visited by the Injury Reaper, the basketball player from Oklahoma City may be well on his way to being one of only a few billionaire athletes. Kind of kills the whole “you need to be in a big market to increase your earning potential” talk. Sports are a strange thing. One second it’s euphoria, ecstasy, and adrenaline all in one bundle. And then the next it’s heart break and sorrow. It’s almost like a drug. And while it’s entrenched in reality, it really isn’t reality. It’s entertainment. Its young men, paid millions of dollars, to do things with spherical objects that you and I wish we could do. For most of us, the entertainment ends when the final buzzer sounds. 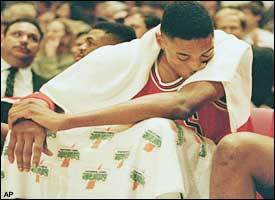 We either pump our chest up in victory, or slump our heads in defeat. And after a couple minutes, the feeling is over. We go back to our lives and move on. But sometimes, sports and real life become intertwined due to circumstances beyond our control. We saw that, not too long ago, in the Boston Marathon bombing. Runners and spectators, alike, sprung into action to make the best out of an extremely chaotic situation. We saw the support on the hardwood from the Boston Celtics players and the support on the diamond from the Boston Red Sox players (especially David Ortiz). From 1700 miles away, it was inspiring and heart-warming to see that kind of support from the local pro athletes. Then, May 20th happened. We, Oklahomans, have been through this before. The Murrah building bombing in 1995. The Moore tornado in 1999. And now, this tornado. We’ve mourned the losses of those killed, mended the hurt and wounded, and have rebuilt even stronger. But, we’ve never done it as a city that houses a professional team. In the grand scheme of things, that last statement doesn’t mean a hill of beans. We would still be doing the things that make us, us. We would still be getting involved in the recovery efforts, the humanitarian aid, and the volunteering, all while maintaining that great Oklahoma spirit. 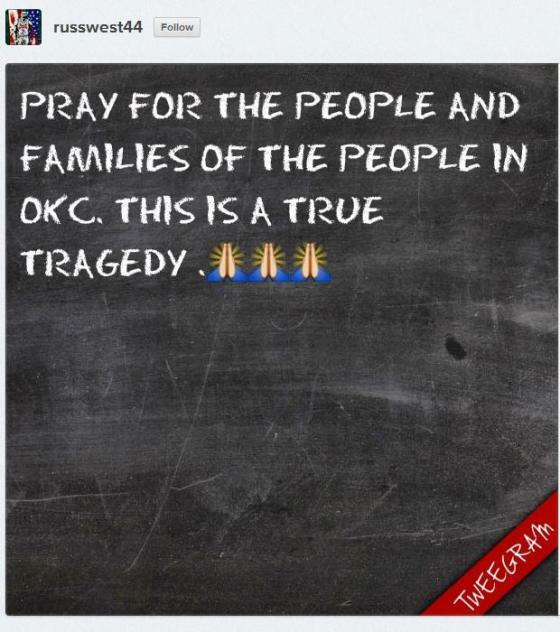 We would have completely understood if the Oklahoma City Thunder players would have just tweeted their well wishes and disbelief about the disaster, donated a couple bucks here and there, and given us their support from afar. They were just starting their offseason after a disappointing post season run that included a season ending injury to one of their superstars. And the reality is that most athletes don’t live in the city where they play year round. After exit interviews, the players usually disperse to their various hometowns for their offseason. We wouldn’t have held it against them if they would’ve stayed away from the disaster zone. There’s an understanding when it comes to the athlete/fan relationship. We, the fans, cheer the athletes on to no end, and, in return, the athletes acknowledge our fandom in their interviews and in social media. It becomes almost scripted when athletes mention their fans as being the best fans in their league or when they say that the crowd played a major role in their comeback. It’s something that the Oklahoma media, and the media, in general, loves to play up. But in our darkest hour, though, there was a bit of a role reversal. The players came out and cheered us on. 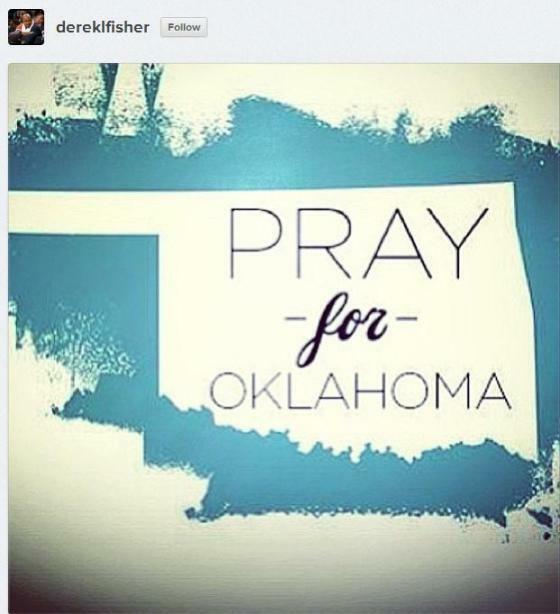 As soon as the enormity of everything became apparent, Kevin Durant, Russell Westbrook, Derek Fisher, Serge Ibaka, Perry Jones III, Nick Collison, and our old friend James Harden, were tweeting and instragramming their well wishes and prayers out to us. If it would have ended there, that would have been awesome. Then, Kendrick Perkins (you know, the player whose head a lot of OKC fans want on their amnesty plate) set up a donation spot at a local OKC store. And if it would’ve ended there, it would have been great. 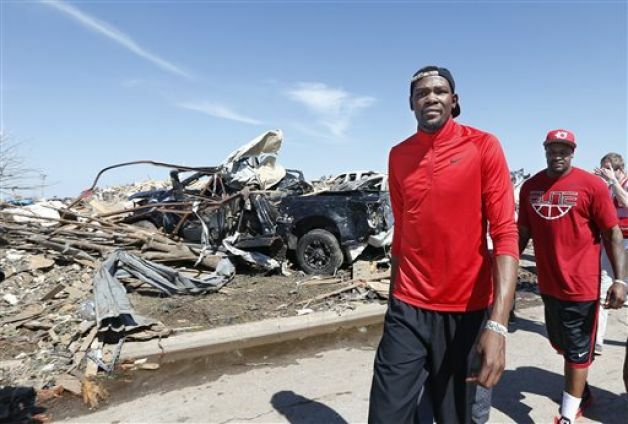 Then Durant stepped it up and donated $1 million dollars to the relief efforts. And Perkins donated $25K to help build future storm shelters. 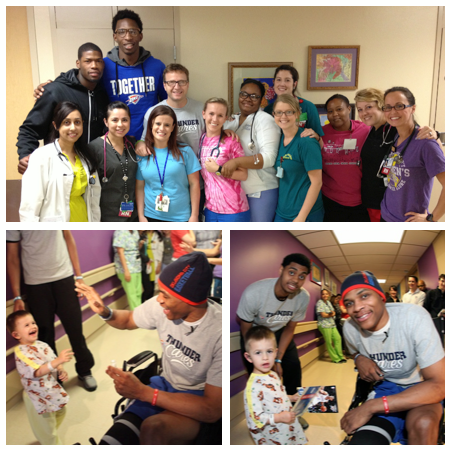 And Russell Westbrook, Hasheem Thabeet, DeAndre Liggins, Jeremy Lamb, and coach Scott Brooks visited OU Childrens’ Hospital to bring some rays of sunshine to children who had probably just witnessed their darkest hour. 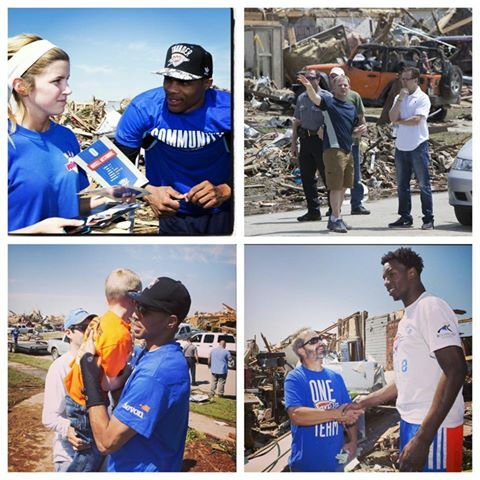 This spurred the Thunder organization and many of their corporate sponsors to donate millions of dollars in aid. If it would’ve ended there, that would have been the best. Then the guys actually started showing up in Moore and walking through the debris and rubble, lending support to those crestfallen by the tornado. You saw Kevin Durant walking around giving encouraging words to those that supported him. You saw Russell Westbrook hobbling around on crutches giving support to those that needed it, even if it was in verbal form. General manager Sam Presti walked around doing his part to help out. 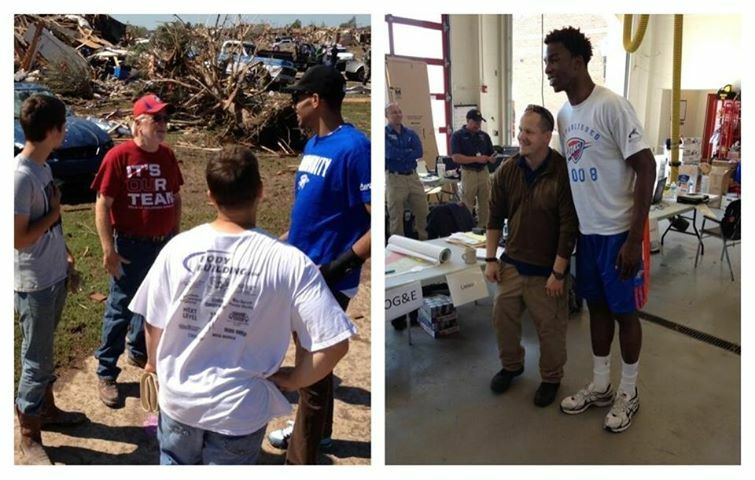 CoachBrooks, Thabeet, Thabo Sefolosha, and native son Daniel Orton could also be seen lending their support throughout Moore. Nike, through their association with Durant, agreed to donate a million dollars worth of merchandise to help in the healing process. And this is just what we’ve heard. Only the person giving actually knows what they have given. During many of the pregame videos in the past few years, the focus has always been about how the values of Oklahomans mesh with the values of the Thunder organization. Resiliency, Team, Together, Team is One, Community. I used to think those were just prompt words to make the team feel more “Okie-centric”. Words aimed at our civil subconscious to make us love the team more. But in the end, the players on the team have shown those values to be true amongst themselves and amongst the team. As a realist, I know that one day, someone on the Thunder will rip our innocence from us. Be it one of our players being charged in a criminal case or a long drawn out contract negotiation in which a superstar will want out of OKC and into a bigger market. That day will come. But for right now, these player have kept our innocence intact. These players have shown their Okie values to be true. We’ve been with them through thick and thin, and now, they have reciprocated that support in our darkest hour. In the athlete/fan relationship, that very rarely happens.